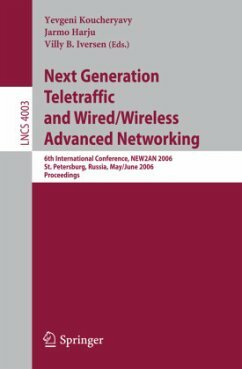 This book constitutes the refereed proceedings of the 6th International Conference on Next Generation Teletraffic and Wired/Wireless Advanced Networking, NEW2AN 2006, held in St. Petersburg, Russia in May/June 2006. The book includes 49 revised full papers presented together with 2 keynote talks. The papers are organized in topical sections on teletraffic, traffic characterization and modeling, 3G/UMTS, sensor networks, WLAN, QoS, MANETs, lower layer techniques, PAN technologies, and TCP.